Waking up on a dark winter morning is never fun. But imagine if the sun didn't come up at all. 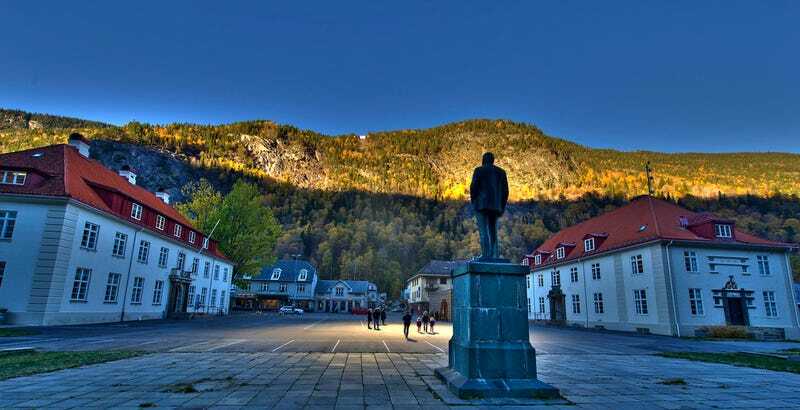 Rjukan, Norway—which is cast into shadow for five months a year—has found a solution. The town is finishing its first winter using a system of mirrors to create an oasis of sunlight during its perpetually dark winter months. We first wrote about Rjukan last year, when the town was finishing the installation of a set of heliostatic mirrors on the hillside that hems it into perpetual shadow. But these beautiful shots from Bilfinger SE show us what the mirrors look like in practice—and it's pretty amazing. Every day from September to March, a computer tilts the mirrors to perfectly reflect the sun's rays onto a 2,000 square-foot spot on the small village's public square. It's the only sunlight Rjukan gets for months. The idea is actually a century old; the town's founder, who built a hydroelectric dam in the valley it sits in, had the inkling but not the technology to carry it out in the early 1900s. Now that the mirrors are finishing up their first full winter of use, how are they working out? The sunspot itself is small, but it looks completely surreal—as though light were shining into our world from some rent in a neighboring universe.